Used about 4.5m of wire taped to a fibreglass fishing pole, fed through a Snowdonia Radio Company UnUn. Resonant frequency came out lower than I thought it would, either the ratio of the UnUn meant that the best length was less than a half wave or the pole was altering the resonant frequency. 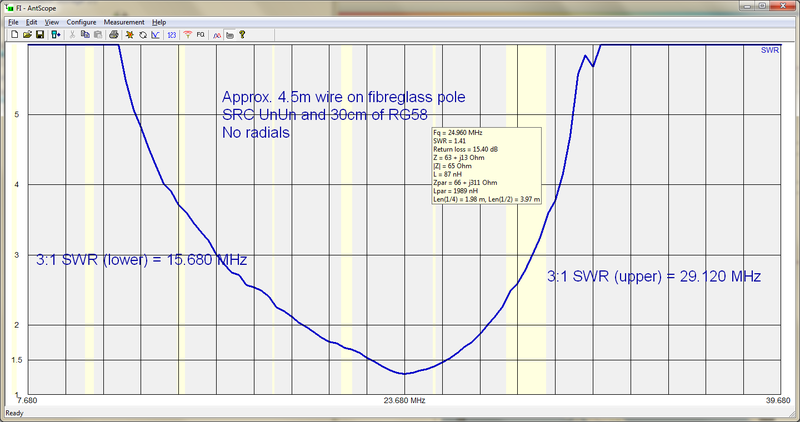 The resonant frequency was 23.680 MHz with a 3:1 SWR bandwidth of 15.680 to 29.120 MHz. That was with no radials and a 30cm patch lead between the UnUn and AA500 analyser. I was holding the antenna vertically above ground in the garden for this test. It should work OK on the 21 and 24 MHz bands, and should be able to get away with 18 and 28 MHz without a tuner. 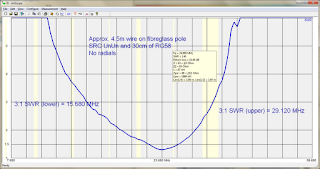 I think about 7.5m of wire would be needed to get the resonant frequency on 14MHz, using either a 7m fishing pole, or coil the wire around the pole to get the extra length.